When did you first get the inspiration that this practice area was your calling? I was admitted to practice in California right after law school in 1989. As counsel for landlords, I handled a large number of eviction cases—literally thousands of appearances at every municipal court in Southern California (my first trial was in Joshua Tree). All that driving got old fast. Later I worked in-house as general counsel for a startup mortgage company, taking them to a national presence. My passion for estate planning ignited when, in 1999, I attended a number of seminars presented by a national network of estate planning attorneys called the “National Network of Estate Planning Attorneys.” While their name was not very creative, the organization did create some very impactful systems enabling attorneys to help their clients more effectively—stuff they didn’t teach us in law school. Though I enjoyed defending the property rights of landlords, I favored the creative process of transactions over the destructive process of litigation. In my in-house position, I enjoyed helping management chart a course for the future as we dealt with problems of the present. It was sort of a family, but there is nothing like helping real families chart a course for their future, their descendants. The family is the one social institution that is closest to God, so families are the essential building blocks of any free society. It is a privilege to help families transmit life, fortune, and honor, to succeeding generations. What excites you each day about what you do? What most excites me about my practice is the chance to help families stay powerful by transmitting life, fortune, and honor, to succeeding generations. On a day-to-day basis, that means meeting with couples and learning about their family and property situation, their hopes and concerns regarding the future, and any particular values they may want to pass on to their kids, grandkids and so on. All too often, an estate plan is viewed simply as a way to divvy up property in a cost efficient manner, possibly with some degree of asset protection. Those are important benefits, but the real power of a trust is found in preserving, protecting and transmitting a lasting legacy of the particular values important to the family. When a family wants me to craft incentive trust provisions channeling all that asset-protected money to further the family’s goals, that’s exciting! The values most important to me, and which guide my practice, are: Faith, Family and Freedom. These values are mutually dependent and essential to the American concept of ordered liberty. The main mission of my practice is to help preserve family power by transmitting life, fortune, and honor, so that succeeding generations have something to pledge whenever needed. My profession requires constant learning so I can guide clients through a constantly changing legal landscape. Estate planning is a complicated field, crossing over several related fields of law. Constant learning enables me to provide highly customized plans rather than merely overpriced word processing of the type provided by many trust mill attorneys taking the cookie-cutter approach. How did you prepare yourself to succeed in delivery of your services? My career prep for this rewarding but competitive practice area includes: attending a top-ranked law school, UC Hastings College of Law, for my Juris Doctor degree; getting a second law degree (LL.M in Taxation) at Chapman, where I received the CALI award for highest grade in Estate Tax; maintaining membership in WealthCounsel, the nation’s leading network of estate planning attorneys; and teaching the public and other attorneys about estate planning, at various seminars. By far, the most valuable resource for my practice is the WealthCounsel membership. Although expensive to maintain, it gives me tools most other attorneys lack and allows me to do the kind of custom planning that really benefits my clients. How do your values guide you in delivering your services? My values of Faith, Family, and Freedom are fairly universal values. Everyone shares them to some extent, although families differ on specific values and the emphasis they place on each. Even the couple at the head of the family may disagree initially, but they may agree on a plan to incentivize certain values they share. For example, the focus may be on Financial Mentorship, on Career Preparation, on Career Maintenance, on Family Maintenance, on Religious Faith, on Charitable Enterprise, or on Punishing certain conduct in a way that rehabilitates. For my family an important value is Firearm Training. (Your family may or may not consider this important.) Whatever values are important to your family, it is important to all of us that they be encouraged through legally enforceable incentive trust provisions. If the estate planning attorney does not present these options, who will? Too many planners focus solely on the financial aspects, which are important but should never drive the planning. What is it in your background that allows you to “stand in the shoes” of your clients? I recently had surgery, under general anesthesia, without an updated estate plan! I was in the process of updating but was notified an earlier appointment was available due to a cancellation, so I proceeded with the surgery right away. My decision might have been different if there was more risk, but this was a very personal reminder of the need to update our estate plan on a more regular basis. But I can certainly understand how life gets in the way of doing so and I offer an optional (and very affordable) trust maintenance plan to make it easier for clients to stay on track. I’ve also had several near-death experiences [SCUBA tank empty (twice, once at 70 feet), criminal threat of violence (twice, once when I was not armed)], so I understand well that estate planning is not only for seniors. And death is not the only reason to plan—we also need to plan for any incapacity due to illness or injury. It is often amusing when clients rush in to complete an estate plan before leaving on a vacation. My response is: If you are that concerned, don’t go on the vacation! But a vacation can actually be a great excuse to get planning done if they have procrastinated. Besides, without proper planning for guardians of minor children, simultaneous death of both parents in a transportation accident (plane, train, automobile, ship, etc.) could be an absolute catastrophe beyond loss of the parents. As a parent and husband, I know that changing family dynamics can also create a need to update guardian nominations, and I am aware of many asset protection and values transmission issues important to families. As the husband of an immigrant from Ukraine, I am sensitive to cross-border and citizenship issues affecting estate plans—for example, special tax planning needed by non-citizens and special temporary guardianship provisions where the permanent guardians are foreign nationals perhaps located in a foreign country. Though generally a lifelong supporter of the Second Amendment, I only recently (about a dozen years ago) became a gun “enthusiast” training regularly, so I understand how corporate and media bias against guns has kept many intelligent Americans from having the facts they need to make an informed choice about guns and the need to carry on a firearm legacy (what I call the “militia ethic”). The free firearm training I offer is not about communicating all these facts but simply providing a pleasant training experience so students will be open to discovering the truth on their own. With just vague support of gun rights and a revolver but no training, I eventually took real firearm training when the opportunity arose. The training I offer uses realistic airsoft training guns rather than real firearms, so even those scared of firearms can take advantage of my free classes and learn the important basics of gun safety everyone needs to know. How have you changed your approach over the years? Initially I drafted a large number of inexpensive plans—not quite a trust mill but very little customization. This was largely dictated by the legal plans that sent business, which did not pay much. My practice is now focused on incentive planning for values transmission, and other advanced planning for folks that want a “real” estate plan. What happened to lead you to these changes? Primarily, it was a change in me that led me to want more sophistication in my practice. The type of practice I had before was mostly boring and routine, and I came to realize the tools I had were insufficient to address the real concerns of some clients. The country also changed, and I came to realize incentive trust planning for the transmission of values could help preserve family power and keep families on a freedom trajectory despite strong cultural crosswinds. Eventually I made the wise decision to join WealthCounsel, the nation’s leading network for estate planning attorneys. This network provides me with tools not available to most attorneys: WealthDocx, the industry’s leading drafting system; an immense library of shared documentation; continuing education, both live and online; and the collegiality of regular meetings and listserv communications that keeps all these resources on the cutting edge. How do you guide your clients from need to solution? Ideally, clients will first attend my free estate planning seminar which covers substantively the issues surveyed in my estate planning questionnaire. Anyone who fills out my questionnaire gets a free two-hour Design Meeting where we sit down and decide on a basic structure for their estate plan. I can cover a lot more ground when clients have first attended my seminar and thought through some of the issues involved. That allows me more time to get to know their situation and explain options available to address problems or concerns they may have, often including new issues that come up during the meeting. Upon engagement, I get to work on initial drafts of the necessary documentation, and send them out for review by clients. Sometimes revisions are minor enough to discuss on the telephone, but I encourage clients to meet a second time to fine-tune the documents. When revisions are completed, we meet again for review and signing of the final documents and initial funding of the trust with some of the clients’ assets. Complete funding is an ongoing responsibility of the clients as trustees, and I am available to assist if necessary. After delivering a solution to a client’s needs, how do you know it is the right choice? The simplest test of adequacy for an estate plan is whether it achieves peace of mind for the client. After completing my process of estate planning, especially if they first attend my seminar, clients are educated about estate planning issues pertaining to them and will often request another review when the need becomes apparent. Regular reviews are recommended because of the many potential changes in assets, law, or family situation. What is the evidence of the quality of what you do? I have produced hundreds of custom estate plans over the last several decades and aside from the obvious objective criteria (none has resulted in any litigation, nor have I ever been sued for malpractice), there is the subjective feedback from existing clients who come back repeatedly for updates when necessary, and from family members that are so grateful for how smoothly trust settlement went, and hire me for their own plans. Why do clients rave about you? How do your clients benefit from the solutions you design? Almost everyone now has heard about the benefits of estate planning in terms of avoiding costly and burdensome probate, dealing with incapacity, and providing asset protection for survivors. But what is the benefit for you, during life? The main benefit of a real honest estate plan is the peace of mind you get from knowing your family is protected and won’t blame you for letting things go terribly wrong in their lives and in the lives of their children. A real honest estate plan can also function like a business plan, improving your focus on family goals and making sure actions are consistent with those goals. A good plan results in more unity, less discord, and if the plan is well-communicated problems will surface in time to correct them. 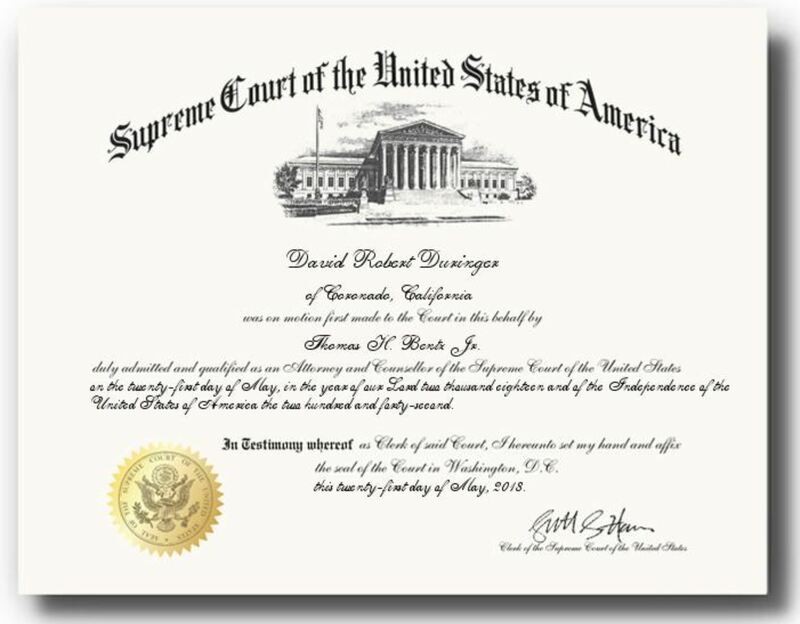 Dr. Duringer is admitted to practice law in all courts of the states of California (1989, #143911) and Washington (1997, #26872); he passed these bar exams on the first sitting for each. He is one of the few attorneys admitted to the bar of the United States Supreme Court, and is also admitted to practice in other federal courts including the United States Court of Appeals for the Ninth Circuit, and the United States District Court, Central District of California. He is a member of the Trust & Estate Section of the State Bar of California, and is also a member of WealthCounsel, the nation’s leading network for estate planning attorneys; he served as Forum Leader for WealthCounsel’s Southern California Forum in 2012-2013. He is one of the few attorneys drafting advanced gun trusts. He is also a licensed Notary Public. He has been a licensed California Real Estate Broker since 1995 (DRE # 01197976), doing business as Duringer Realty, and is a Certified Distressed Property Expert. He is also licensed by the California Department of Insurance (# 0F70573). As a faculty member of the National Business Institute, Dr. Duringer instructs fellow attorneys on trusts, tax planning, and other estate planning topics. The free training events at Duringer’s office may include estate planning, firearm training, or both, depending on the event. No real firearms are used, only realistic airsoft training guns. (See Protect.FM for the event calendar.) David is a licensed concealed firearm instructor, and is authorized by the Orange County Sheriff’s Department to provide the required class for the California License to Carry a Concealed Weapon (CCW). Most of his training, including Advanced Tactical Handgun and Handgun Combat Master Prep, has been as a life member (and Distinguished Graduate) of Front Sight Firearms Training Institute, which he started attending in 2000. On February 13, 2019, Sir David Duringer was inducted into the Order of the Knights of Front Sight. (His wife, Helen, and daughter, Ayn, are also life members at Front Sight.) He is also certified by NRA to instruct in several capacities. He is an Affiliated Attorney of the Armed Citizens Legal Defense Network. Duringer is an Eagle Scout, was one of the first California Minutemen in 2005, and ran several times as a tea party candidate for Orange County’s Republican Central Committee. In 2016, he served as grassroots leader for Donald Trump in Orange County’s 45th and 49th congressional districts. Duringer’s law practice is dedicated to Family Protection. Its mission is to use asset protection and incentive trusts to help families preserve family power by transmitting life, fortune, and honor, to succeeding generations. One aspect of this is to carry on the Firearm Legacy, but to be interested in this the family must first experience firearm training. Other aspects include Asset Protection, Business Planning, and transmission of values such as Financial Mentorship, Career Planning, etc. Good estate plans protect families in a number of ways, but to accomplish this requires a balance between speed and deliberation. The plan must be customized for the family with careful deliberation, yet with alacrity and sufficient celerity to maintain planning momentum. This requires multiple meetings, constant contact and educational engagement with clients, using the latest technology.